With refrigerator, microwave and other amenities. Stay 2 Nights – Save $10.00 per night when you stay 2 or more nights. Book Ahead – Save 15% off regular hotel rates plus get 100 Whyndham Rewards bonus points. Enjoy family friendly accommodations and great value at the Ramada Plaza Resort and Suites on International Drive in Orlando. Stay in the center of all the action. 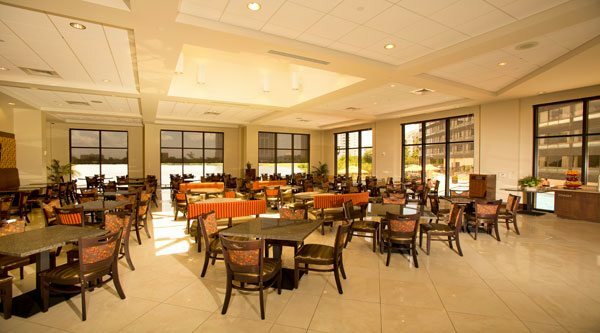 The Ramada Plaza is located only a mile away from Universal Orlando, two blocks from the Wet ‘n Wild water park, and only three miles north of the Orange County Convention Center, which is also located on International Drive. Our two 12-story towers offer 295 spacious guest rooms and suites featuring plush double queen beds or king beds, many with a lakefront view and a fantastic view of the Orlando skyline. The Ramada Plaza Resort and Suites features two distinct towers each offering guests a room for every need. All public areas are located in the new tower – the North Tower. The main entrance includes the front desk/reception area, business center, guests service and standard standard room breakfast room, along with ground floor lakefront heated pool & spa. The second floor in the suites tower offers the enhanced continental breakfast for the suites guest along with the meeting & BBQ’s space. When you are staying away from home, is important to have the comforts of home in your hotel. The Ramada Plaza Resort & Suites International Drive offers affordable accommodations in Orlando and modern amenities in our two 12-story towers, 295 guestroom hotel. Guests can enjoy the following hotel amenities during their next stay in Orlando. “Great Stay” – I stayed for seven days and enjoyed my vacation really much. “Pleasantly Suprised at this Ramada” – We were two families traveling together and basically needed rooms for the night while going to Universal and before heading to Disney. While this is no luxury hotel, the lobby was lovely and the beds were surprisingly comfortable. “Nice Hotel” – The staff was really friendly, service was top notch, the room was really clean and comfortable. Will definitely be back. “Great Value for the Price” – It’s a good location nearby Universal studios with a lovely pool and good value for the price with breakfast included. “Ideal Location and Great Price” – The room was clean, beds were comfy and view was fantastic.